To determine a position on the Earth's surface, it is necessary and sufficient to know the latitude, longitude and altitude. Altitude considerations can of course be ignored for vessels operating at sea level. Until the mid 1750s accurate navigation at sea out of sight of land was an unsolved problem due to the difficulty in calculating longitude. Navigators could determine their latitude by measuring the sun's angle at noon (i.e., when it reached its highest point in the sky, or culmination). To find their longitude, however, they needed a time standard that would work aboard a ship. Observation of regular celestial motions, such as Galileo's method based on observing Jupiter's natural satellites, was usually not possible at sea due to the ship's motion. The Lunar Distance Method, initially proposed by Johannes Werner in 1514, was developed in parallel with the marine chronometer. The Dutch scientist Gemma Frisius was the first to propose the use of a chronometer to determine longitude in 1530. The purpose of a chronometer is to measure accurately the time of a known fixed location, for example Greenwich Mean Time (GMT). This is particularly important for navigation. Knowing GMT at local noon allows a navigator to use the time difference between the ship's position and the Greenwich Meridian to determine the ship's longitude. As the Earth rotates at a regular rate, the time difference between the chronometer and the ship's local time can be used to calculate the longitude of the ship relative to the Greenwich Meridian (defined as 0°) using spherical trigonometry. In modern practice, a navigational almanac and trigonometric sight-reduction tables permit navigators to measure the Sun, Moon, visible planets, or any of 57 navigational stars at any time that the horizon is visible. The creation of a timepiece which would work reliably at sea was difficult. Until the 20th century the best timekeepers were pendulum clocks, but the rolling of a ship at sea made a simple gravity-based pendulum useless. 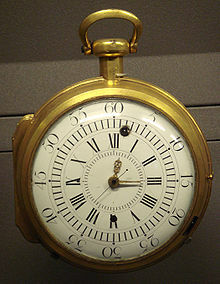 Christiaan Huygens, following his invention of the pendulum clock in 1656, made the first attempt at a marine chronometer in 1673 in France, under the sponsorship of Colbert. In 1675, Huygens, who was receiving a pension from Louis XIV, invented a chronometer that employed a balance wheel and a spiral spring for regulation, instead of a pendulum, opening the way to marine chronometers and modern wristwatches. He obtained a patent for his invention from Colbert, but his clock remained imprecise at sea. Henry Sully (1680-1729) presented a first marine chronometer in 1716. More attempts were made by Jeremy Thacker in England in 1714, and Henry Sully in France in 1716, who published his work in 1726 with Une Horloge inventée et executée par M. Sulli, but these inventions remained unable to resist the rolling of the high seas and keep time precisely enough. Drawings of Harrison's H4 chronometer of 1761, in The principles of Mr Harrison's time-keeper, 1767. Ferdinand Berthoud marine chronometer no.3, 1763. 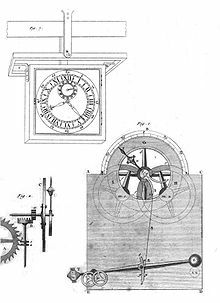 John Harrison, a Yorkshire carpenter, then submitted a project in 1730, and completed in 1735 a clock based on a pair of counter-oscillating weighted beams connected by springs whose motion was not influenced by gravity or the motion of a ship. His first two sea timepieces H1 and H2 (completed in 1741) used this system, but he realised that they had a fundamental sensitivity to centrifugal force, which meant that they could never be accurate enough at sea. Construction of his third machine in 1759, designated H3, included novel circular balances and the invention of the bi-metallic strip and caged roller bearings, inventions which are still widely used. H3's circular balances proved too inaccurate and he eventually abandoned the large machines. 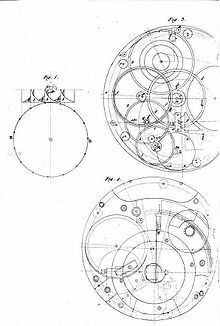 Harrison solved the precision problems with his much smaller H4 chronometer design in 1761. H4 looked much like a large five-inch (12 cm) diameter pocket watch. In 1761 Harrison submitted H4 for the £20,000 longitude prize that had been offered by the British government in 1714. His design used a fast-beating balance controlled by a temperature-compensated spiral spring. This general layout remained in use until stable electronic oscillators allowed very accurate portable timepieces to be made at affordable cost. Harrison then published his work with Principles of Mr. Harrison's time-keeper in 1767.